Saffron is the world’s most expensive spice by weight. Saffron threads are the stigmas of a low-growing, purple-flowered crocus. Each flower produces only three threads, which must be picked and sorted by hand. It is also used for its slightly woody and sweeter floral aroma, colour and medicinal properties. Saffron’s golden color can be imitated by cheaper spices such as safflower and turmeric, but its rich and delicate flavor is unable to be imitated. It is highly valuable and has been used to colour and flavour dishes in a variety of cuisines, including Indian dishes such as saffron rice and biryani, Spanish dishes such as paella, Italian risottos and French bouillabaisse, as well as a range of other recipes including breads, seafood dishes and soups. Saffron threads are used in all manner dishes, particularly those that include seafood and shellfish, as well as a variety of rices, sauces and soups. Prepare by placing whole threads into a small amount of hot liquid – either milk, stock or water – to allow the flavour and colour to release before adding to the dish. 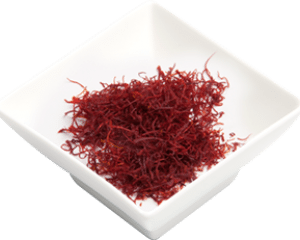 Saffron is best added during cooking to allow maximum flavour to develop. Only half a gram is usually needed to flavour most family size dishes. Used to colour and flavour dishes such as paella and biryani, breads, cakes, fish, risotto, and bouillabaisse.